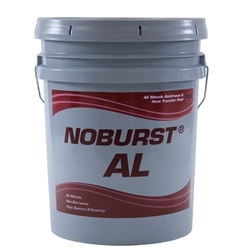 NOBURST AL is an antifreeze and heat transfer fluid for systems that contain Aluminum components. NOBURST AL has inhibitor technology that is compatible with all metals commonly used in hydronic heating systems including brass, cast iron, steel, solder, copper and aluminum. The product is to be used in place of water and other water-like fluids in systems where freezing may either cause damage or interfere with the functioning of the system. NOBURST AL is NOT safe for use when there is a possibility of contact with potable water.